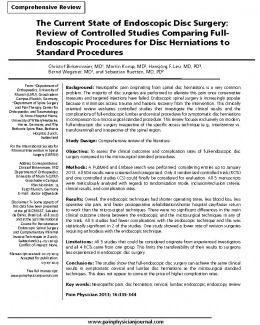 In the past several years a large number of different endoscopic operative procedures have been developed for, and introduced into the clinical setting; therefore a need arose to offer our members some guidelines for the clinical practice of spinal endoscopy along with a list of references on clinically proven procedures. The ISMISS Board of Directors collaborated on a state of the art support and back-up document on methodical questions that may be raised in our practices regarding endoscopic spinal surgery. It is our great pleasure to publish for our members and other interested practitioners in the field of minimally invasive spinal surgery our second edition of "Guidelines for Endoscopic Spinal Surgery", approved by the board of ISMISS in its session of Jan 28, 2010. We welcome critical and technical input for consideration in periodic reviews of these guidelines and thank you all in advance for your contributions.